About an hour after the update I posted yesterday I heard some peeping right outside my kitchen window. 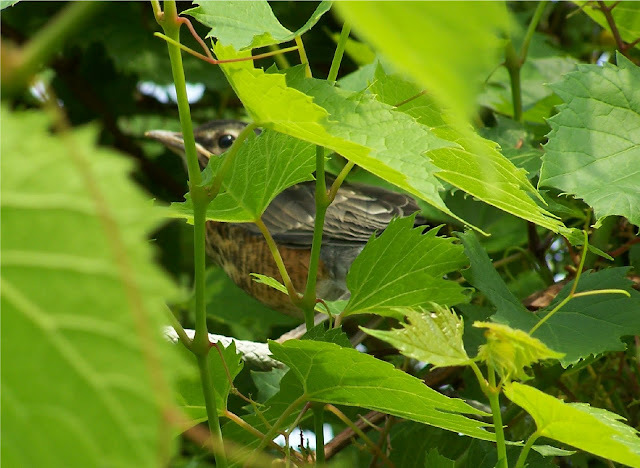 I was happy to see that it was one of the baby robins that had been missing from the nest earlier in the day. I took a quick photo out the back door which you can see a couple photos down. 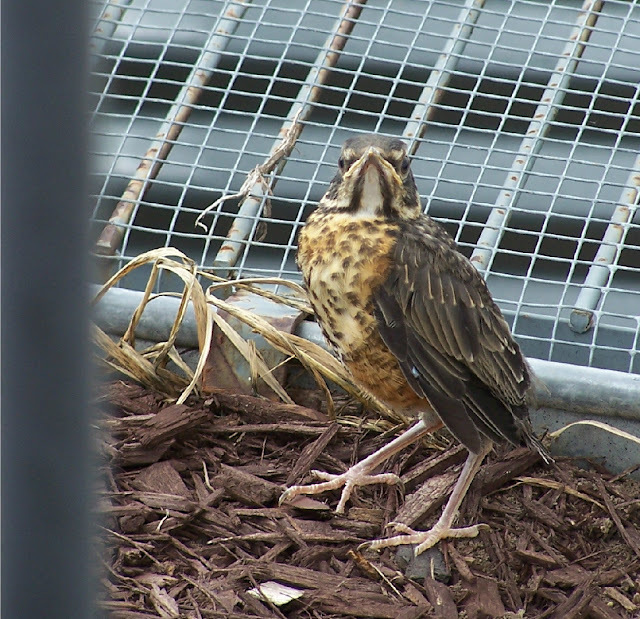 The little birdy in the mulch by the basement window grate. After I took the photo I went by the front door to see the others in the nest and there was only one left! 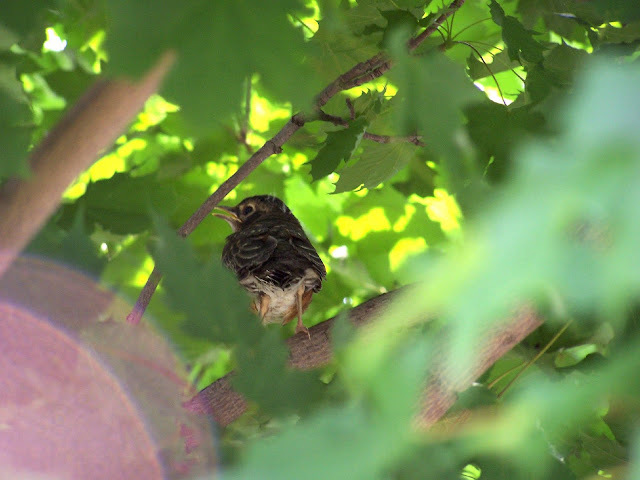 Instead of crouching down in the nest he took one look at me stood up tall and flew away! I am so happy I had my camera with me and the photo above is his very first flight from the nest. I was so worried that he would fly right into the street but he made it to the tree in my front yard. He was really hidden in the leaves but I was able to get one photo of him hiding in there. 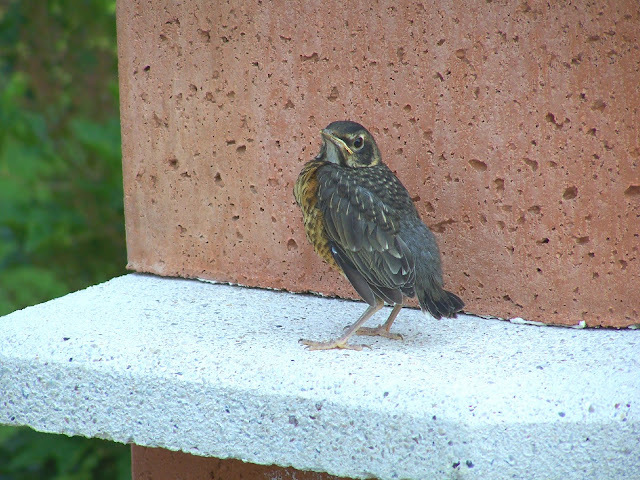 This is the little guy I heard peeping outside my kitchen window and when I came back he had made it to the fireplace on my patio. The whole time mama robin was chirping loudly to him from the top of the fence next to the farmer's yard. I love this photo! Look at how proud he looks! 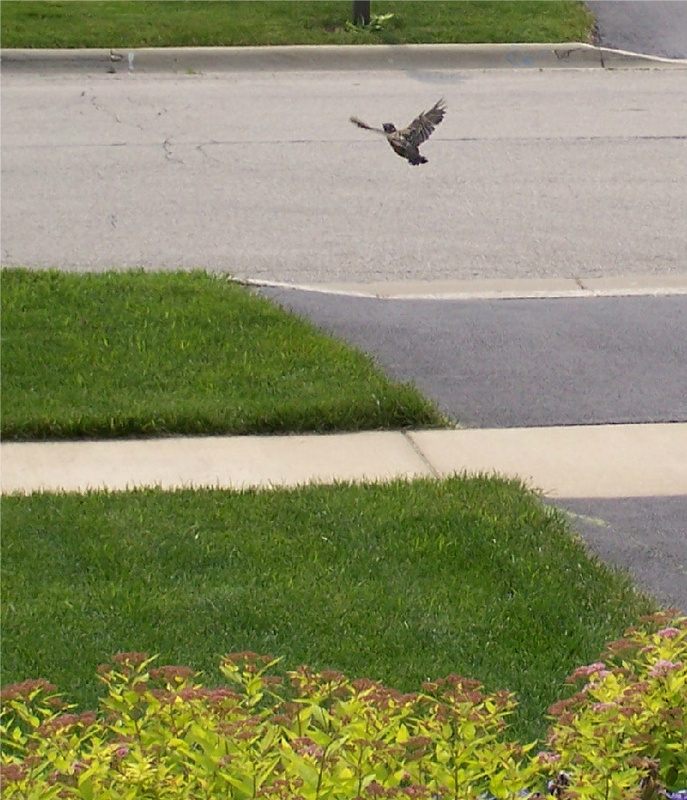 Unfortunately when he took off he ended up smacking into the fence. 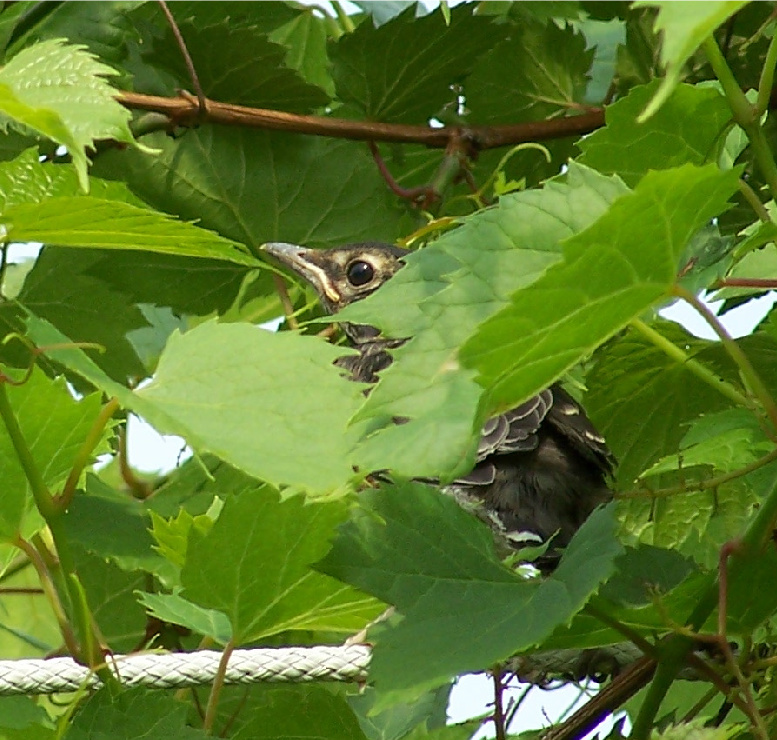 But he eventually made it to the vines covering the top of the fence and hid in there chirping for mom for awhile. ﻿I am very sad that they are gone and I am still shocked at how fast it all happened! I really hope that they are safe because we had a bad rain storm last night. I keep walking out my front door expecting to see them there. I really miss them. I was thinking about saving the nest but it's really covered in poop so I will be throwing it away! 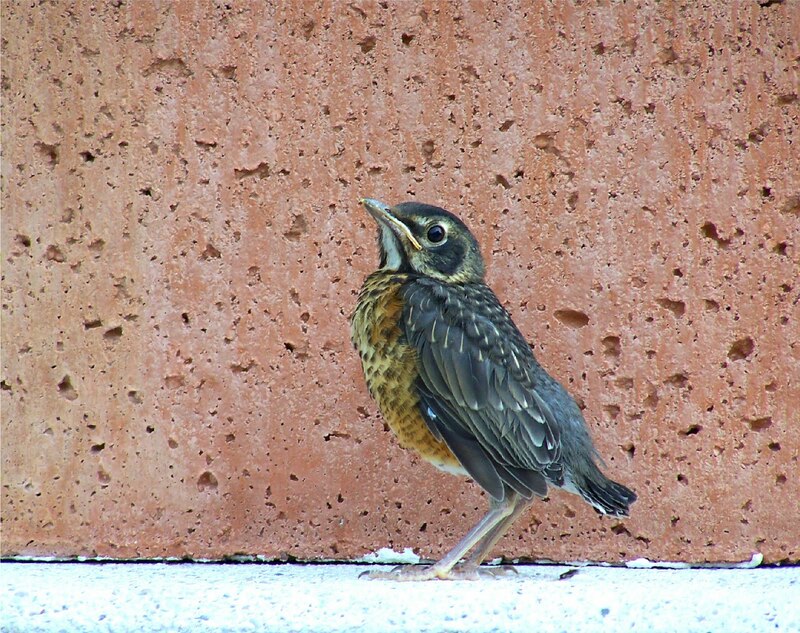 But I still heard mama robin chirping outside this morning. At least I'd like to believe it was her. Isn't it amazing what the babes have to go through? The trial runs are so fleeting and then where do they go? The baby on my doorstep was more spotty, a girl. what amazing shots you got: you should be so proud too. i just love this story you've kept us up-to-date on. but you know? you have the photos and that's special. I can't believe they have flown away already! I feel quite sad about that for some reason! I absolutely LOVE that photo of the baby side on with the reddish wall behind him. It's stunning! Thanks so much for sharing your babies with us.